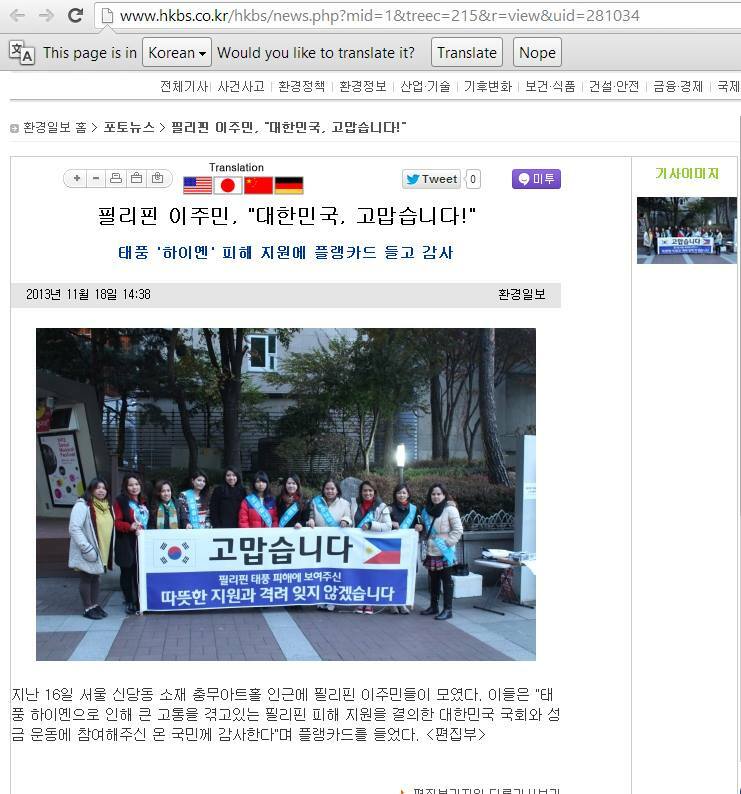 On November 20th, an online newspaper in Korea posted our photo with the banner thanking Korea for their help. It was taken on November 16th at Chungmu Art Hall in Seoul. On that day, we held a fundraising in front of the theater selling Philippine-made accessories, mangoes and leche flan. It was a spur of the moment activity and while we didn’t have enough time to publicize the said event, the ladies from FILIPOS came to help. In fact, we only posted an invitation at around 8 o’clock on Friday night, November 15th. We raised closed to 500,000 won in the three hours that we were there. Again, thank you to the ladies of FILIPOS for helping out that day. Thank you to the management of Chungmu Art Hall for letting us hold the fundraiser and of course, to the Koreans who donated money or bought our goods. Thank you Korea!